Ernie Stautner was the first player ever to have his number retired by the Pittsburgh Steelers, and it was well earned as he was the first of their Hall of Famers to play his entire career with the team. The team's second-round draft pick in 1950, Stautner's No. 70 was retired in 1964, a deserving honor for a legend. 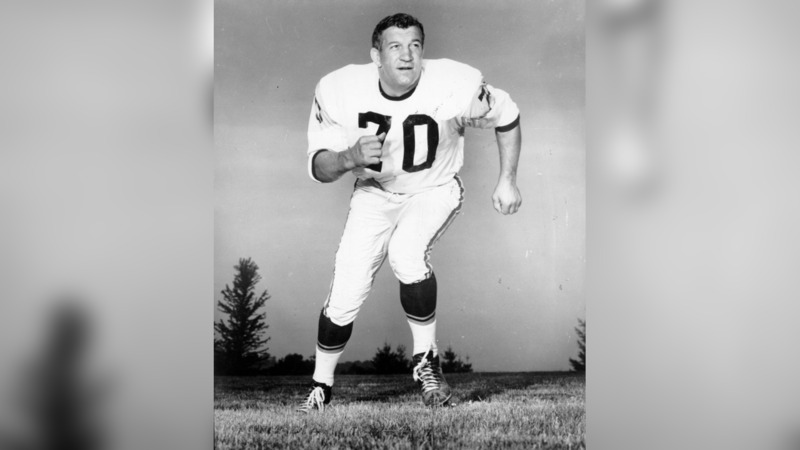 Stautner won the NFL's Best Lineman Award in 1957 and he earned All-NFL honors nine times, despite being considered undersized. He missed just six games during his 14-year career, never letting numerous injuries slow him down. "That man ain't human. He's too strong to be human," Jim Parker, the Hall of Fame offensive guard for the Baltimore Colts once said. "He's the toughest guy in the league to play against because he keeps coming headfirst. Swinging those forearms wears you down. "That animal used to stick his head in my belly and drive me into the backfield so hard that when I picked myself up and looked around, there was a path chopped through the field like the farmer had run a plow over it." Stautner, who was named to nine Pro Bowls, chose Art Rooney Sr. to be his presenter at the Hall of Fame. Take a look at a collection of photos of Ernie Stautner, In one of 22 galleries featuring all Steelers Hall of Famers. "For 14 years, Ernie was not only Pittsburgh's greatest lineman, but one of the greatest linemen in professional football," said Rooney during his introduction. "For nine years he was chosen for the all-pro game and then I was trying to recollect in the 14 years that he played for us had he ever missed a game and I can't remember him ever missing a game. "Not only did Ernie play defensive football for us but many times when the going got rough, which was often, he played offense too. He's been a credit to all athletes, and certainly been a credit to professional sports." A humble and happy Stautner, thanked Rooney and talked about how special an honor being elected to the Hall of Fame was. "Little did I really know then that football, with all the pains and mental anguish that go with it, would bring me such great personal pride and pleasure," said Stautner in his speech. "It truly surpasses all my dreams and expectations. To be selected to Professional Football's Hall of Fame happens to very few and I feel extremely proud to be one of those chosen. "You know no one receives such a distinctive honor through their efforts alone. In my case, it was greatly through the efforts of my great owner, Mr. Rooney, my coaches who taught me well, my family who encouraged me, and my opponents who realistically made me work but particularly because of my teammates of the Pittsburgh Steelers that I am here." Stautner, who was born in Germany, died in 2006 at age 80.